How much tablet can you feasibly get for under £100? If you're working to a very strict budget then the Gigaset will keep you content. Its low price comes with reasonable specs and good build quality. But if you can afford to spend a little more there are better tablets out there. You might well have heard of Gigaset before, though perhaps under a different name. I certainly have, though I was previously only familiar with it as a purveyor of landline telephones. In years gone by it had the more reputable moniker of Siemens, a pioneer in DECT cordless phone communications. Since the buyout of Siemens' consumer business in 2008, the telecoms specialist has dabbled in Android-powered home phones. Beyond that its experience with tablets and smartphones is seemingly rather limited. I first heard of the Gigaset QV830 and its larger brother the QV1030 back in November 2013, after which they were promptly released in Germany just in time for Christmas for €199 (US$270, £165, €369 (US$502, £307, AU$550), respectively. Now that the Gigaset QV830 has made its way over to the UK, with the lower starting price of £99 (US$168, AU$179), it looks like a serious budget tablet contender. 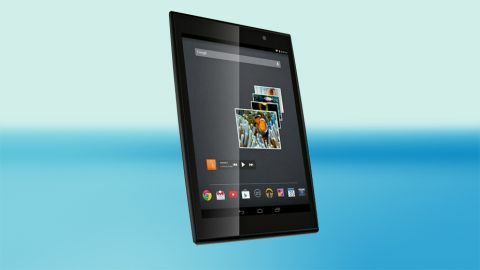 For a price that rivals the Tesco Hudl and is significantly cheaper than either the Nexus 7 or iPad Mini 2, you get a metallic body, 8-inch HD screen and 1.2GHz quad-core processor coupled with 1GB of RAM and 8GB of memory (which is expandable with micro-SD storage) among other things. Android 4.2.2 it not the latest version of Google's OS, but you've still got access to tens of thousands of apps. It might not rival the iPad in terms of build quality, but it certainly is cheap. The question is: is it worth a punt? Most tablets at this end of the price war are made of nothing more than cheap plastics, so it's a surprise to find a tablet that is both incredibly cheap, and made largely of aluminium. Sure there are still plastic trims, and don't be fooled by the chrome-effect on the top and bottom edges, either. Only the back is covered in aluminium and painted black, though the Gigaset QV830 is certainly better for it. It feels thin and light at just 8mm thick, and weighs in at 319g. All in all very similar in dimensions to the original iPad Mini, which was a hair thinner at 7.5mm and 331g. You can't blame Gigaset for basing its first tablet on a renowned success, but at a third of the price, it's unsurprising that it has cut corners in other areas. The 8-inch screen lies underneath a layer of glass that very nearly reaches the edge, buffered by a thin bezel of plastic that joins up with the metal back plate. The screen itself however, has a reasonable 5mm gap all around the edge. It's difficult to be too harsh on Gigaset for this because as opposed to smartphones, tablets usually need a bit of bezel for you to hold on to. Overall, build quality isn't quite as good as the polycarbonates of the Asus-built Google Nexus 7, or the metallic finish of Apple's iPad Mini. But it's far from being the worst built budget tablet around and I was pleasantly surprised at how solid it felt.